To meet the ever increasing demand of the metal parts, metalworking industries has adopted the automation system to accomplish variegated metalworking operations, incorporating metal cutting, forming, stamping, welding and assembly, which manifests the rigorous surrounding of the metalworking industries. This conveyor belt for metalworking industry a finished product of the quality proven manufacturing practices in accordance to the international quality standards, accompanied by the severe tests against the several parameters, make it the truly trustworthy choice for the metal working industries. 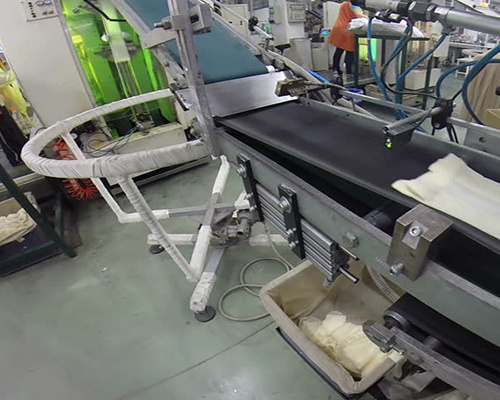 The offered conveyor belt for metalworking industries is made to outlast under the rigorous metalworking conditions, manufactured inputting vulcanized PVC/PU material along with carcass in order to impart excellent resistance against abrasion, cutting, bumping, heat and fire, essential to increase the lifeline of thereof. There is no scope of hazard under rigorous surrounding and therefore is the best bet for hot working, rolling, forging, pressing, hammering or whatever you need to complete the metalworking venture. The unstoppable performance of our conveyor belt at several metalworking industries without failing is the enough confirmation of its capabilities, available with the different patterns and also with the side walls and cleats as per the need of end user, whilst custom made service is always there for customers, because for us, customer’s success is our success.